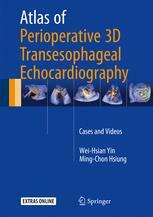 This book presents a series of over 50 cases in 3D transesophageal echocardiography. In each case, background information is followed by a step-by-step approach to patient diagnosis and postoperative outcomes. The book’s most outstanding highlight consists in over 600 illustrations, which mainly focus on 3D transesophageal echocardiography in combination with 2D transesophageal echocardiography, X-ray fluoroscopy and computed tomography to demonstrate the various cardiovascular pathologies. Since the echo images obtained in clinic practice are moving images, it also includes more than 450 videos, which effectively supplement the static illustrations. The atlas is divided into 11 chapters. Chapters 1 through 3 describe abnormalities affecting mitral, aortic, tricuspid and pulmonary valves, while prosthetic valves are discussed in Chapter 4. Chapter 5 details abnormalities of the aorta. Chapters 6-8 examine coronary artery disease, congenital heart disease and cardiomyopathies, while Chapter 9 explores cases of infective endocarditis. Chapter 10 deals with tumor and mass lesions, and the other cases are collectively addressed in Chapter 11. Offering a valuable new resource, the book will enhance the usefulness of echocardiography during operations as a “third eye” for surgeons.